Renewed calls for a public inquiry into the Welsh NHS have been made after spot checks found problems at 20 hospitals. The spot checks followed criticism over the care of elderly patients. Management of medicines will be improved but investigators found no serious problems over continence care, hydration or night-time sedation. Health Minister Mark Drakeford said no "systemic failures" had been discovered but Conservative Darren Millar said a wider inquiry was needed. Speaking to BBC Radio Wales, Mr Drakeford said: "The very good news as far as patients and staff are concerned is that the report shows that in three of four of the issues there is no systemic issue of any sort. "Patients are looked after carefully and with compassion. "And in one area, that of medicine management, there are things we need to do to make sure medicines are properly stored; that security for medicines is improved. "Now we'll take action across Wales to make sure that happens." The spot checks were carried out after the publication in May of the Trusted To Care report, ordered by Mr Drakeford. 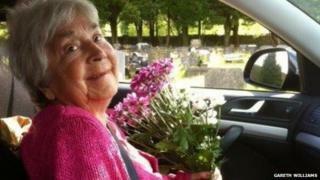 It followed a BBC Wales report in July 2013, it found found failings in the care of Lilian Williams, 82, from Porthcawl, at two hospitals run by Abertawe Bro Morgannwg University Health Board (ABMU). In Thursday's report, Learning from Trusted To Care, the investigators said: "Overall we found no systemic issues of concern about patient hydration, continence needs or the use of sedation. "We did find individual areas where improvements were needed, but we also observed many examples of notable practice. "We did however find areas for improvement with medicines management on wards throughout NHS Wales. The main issues we have found related to the safe and secure storage of medicines." Darren Millar, the Conservatives' shadow health minister, said: "Spot checks need to be a permanent feature of the Welsh hospital inspection regime but they will never replace the need for a much wider inquiry ... so we can get to grips with the roots of the problems that are manifesting in our health service across Wales and deal with them once and for all." Mrs Williams's son Gareth, founder of the ABMU Victim Support Group, also called for a wider review, claiming the two reports did not go far enough to address "the serious concerns that we have". "It's not just about care for the elderly; it is the whole spectrum of care and services that is causing grave concern," he said. Mr Drakeford said "lessons we have learned" from the spot checks would be used to improve the care of older people in Wales, with a new working group to look at the way medicines are administered, recorded and stored. But he added that the spot checks had failed to uncover a "much bigger story" of serious problems at hospitals across Wales. "The difficulties in the one place are not systemic, not characteristic, not something that patients or families have to be anxious about across the NHS as a whole," he said. An inquiry by ABMU into alleged falsifying of patient records had led to a total of 15 nurses being suspended by July 2014. The Welsh NHS Confederation welcomed the report saying it highlighted the "good practice" being carried out in hospitals, but added that work continued "to make sure every patient in NHS Wales receives compassionate, respectful and dignified care". How did your Welsh hospital perform in spot checks?